Beauty Ah, Chief, are you still pursuing me? Chief Well, has your search for a thrill brought you happiness and peace of mind? Chief Adventure is no substitute for love. You are cold, cold as a marble statue. Pygmalion carved a statue of Galatea and so great was his love for this marble image that he brought it to life. Beauty And do you expect to bring me to life? Chief sings "Thrill Of Love" or - in later versions - "Only You". Glenn Mitchell suggests in The Marx Brothers Encyclopedia that while Beauty and Chief was duetting in Scene 5, Harpo was pulling a rope across the rear of the stage until he exited but (by means of a double) emerged tugging at the rope's opposite end at the song's conclusion. This routine was remade by Harpo in "NBC Colgate Comedy Hour", a TV appearance with Donald O'Connor in 11 November of 1951. Unfortunately, the original kinescope has a damaged second half and this part of Harpo's appearance is believed to be lost. Scene 6 depicts Beauty visiting the Marble Fountain and watching the D'Andrea-Walters version of the old Greek legend of Pygmalion and Galatea. Pygmalion was the King of Cyprus who created Galatea, a lifelike statue of his ideal of womanhood. The statue was so beautiful that Pygmalion fell in love with it, prompting Venus (a.k.a. Aphrodite), the Goddess of Beauty and Love, to turn Galatea into a living woman and presid over the marriage of the two. The story of Pygmalion and Galatea also inspired George Bernard Shaw to write the play Pygmalion, which in turn was the basis of popular musical My Fair Lady. 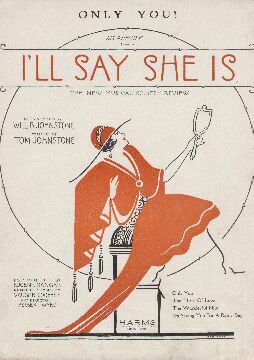 In a review of the I'll Say She Is, Alexander Woollcott mentioned "the regular allotment of statues coming to life", an obvious reference to the scene. In Hello, I Must Be Going by Charlotte Chandler, Groucho and Erin Fleming talks about a parodic dance the Marx Brothers did in I'll Say She Is, copying the dance the accomplished dancers had done. Groucho: "Dressed as tramps. And we danced better than they did". Groucho recalled the tramp parody as being after D'Andrea and Walters' dance in the Wall Street-sequence, but as Glenn Mitchell points out in The Marx Brothers Encyclopedia, it seems more plausible that the parodic "Tramp Ballet" in fact was The Death of Love, which features all the Marxes except Chico.